Karumba, Mary and Edwin Muchapondwa. 2017. 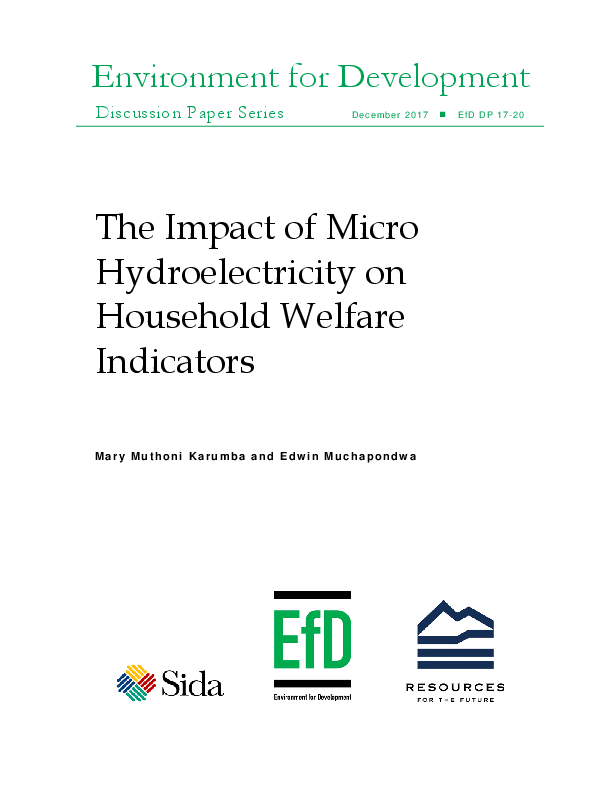 “The Impact of Micro Hydroelectricity on Household Welfare Indicators.” EfD Discussion Paper Series 17-20. The use of small-scale off-grid renewable energy for rural electrification is now seen as one sustainable energy solution. The expectations from such small-scale investment include meeting basic household energy needs and thereby improving some aspects of household welfare. However, these stated benefits remain largely hypothetical because there are data and methodological challenges in existing literature attempting to isolate such impacts. This paper uses field data from micro hydro schemes in Kenya and a propensity score matching technique to demonstrate such an impact. We find that, on average, households connected to micro hydroelectricity consume 1.5 litres less kerosene per month compared to households without any such electricity connection. Also, non-connected households spend 0.92 USD more for re-charging their cell phone batteries per month in comparison to those who were using micro hydroelectricity service. Finally, school children from households that are connected to micro hydroelectricity were found to devote 43 minutes less to evening studies compared to those without electricity. The findings provide interesting insights about some of the claims made for or against the use of off-grid renewable energy for rural electrification.